If someone asked you to name the two coolest things you could ever see in nature, your answer would be “volcanoes and lightning.” Or possibly “lightning and volcanoes,” I guess, but those are the only two options—it’s just a fact. But nature, it seems, is constantly looking for new ways to impress us—which is why it went ahead and made volcanic lightning a reality. 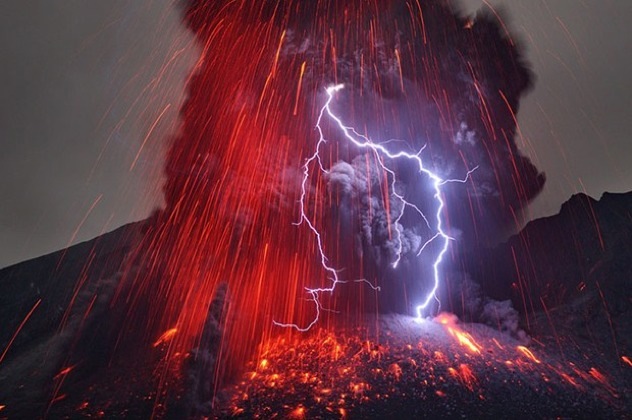 And yes, it’s exactly what it sounds like—a lightning storm that takes place in the middle of a volcanic eruption. Scientists aren’t 100% sure why this happens, but the primary theory goes that when a volcano erupts, it projects positively-charged debris into the atmosphere. These charges then react with negative charges already present, which results in 1) a bolt of lightning, and 2) a really cool picture. 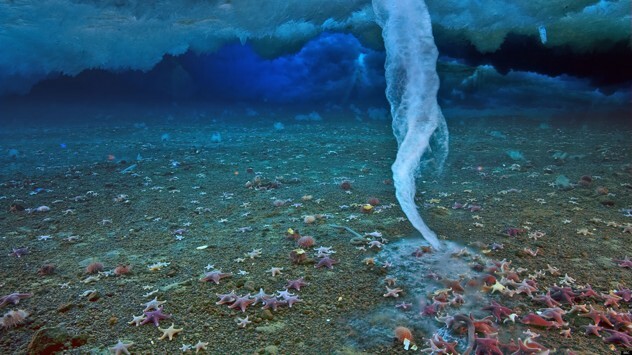 When the surface of the sea freezes—such as around the north and south poles—it does so in a way that forces pockets of especially cold and salty seawater to gather on the underside of the ice. This mixture of brine is denser than the seawater below it, and as a result it tends to slowly sink to the bottom. Now, because it’s so cold, the fresher water below the brine actually freezes around it as it falls, which results in a giant icicle under the surface. The technical name for this sort of thing is ‘ice stalactite,’ but what kind of boring title is that for such a breathtaking phenomenon? Hence the need for their cool nickname, ‘brinicles.’ Regular English didn’t have a good enough word, so we had to come up with a whole new one (or, more accurately, sloppily mash together two old ones). Here’s another cool ice formation, about as far away from underwater as you can get—high in the mountains. 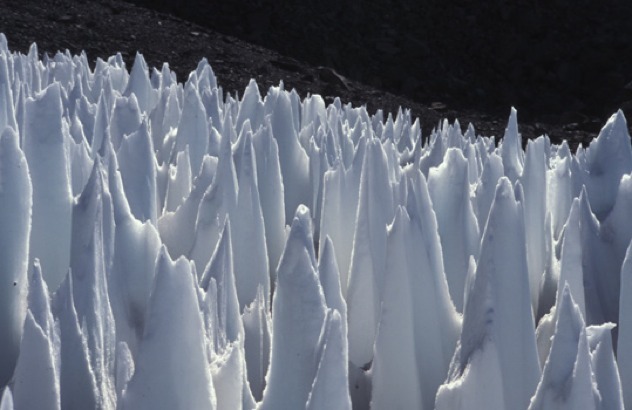 These spiky fields of ice are called penitentes, and each individual shard can be up to a whopping 13 feet (4 meters) high. These intimidating snow structures are formed in high-altitude areas with low humidity, such as the glaciers of the Andes mountains. If the conditions are right, the sun’s rays are so hot that they can actually sublimate fields of snow—meaning that the frozen water vaporizes without ever becoming a liquid. This leads to slight pockets in the ice, which—thanks to their shape—actually end up attracting even more heat. The sharp spikes, then, are just the lucky parts of the snowfield that the sun didn’t target for complete and utter annihilation. If Superman is basically a stronger, more flight-enabled version of a regular man, then a supercell is basically a stronger, more tornado-enabled version of a regular storm cell. This is because—much like tornadoes—supercells have the tendency to spin around a lot, but also—and more importantly—because supercells can actually create tornadoes. If you remember one thing after reading this article, let it be this: stay the hell away from things that can do that. In case it needed to be mentioned, supercells are the most dangerous of the four major storm types, in addition to being the scariest to look at. Thankfully, they’re also the most rare, and tend to be confined to the central United States during the springtime. If you ever happen to come across one, wherever you are, just remember the advice you got in the last paragraph: move in the other direction. 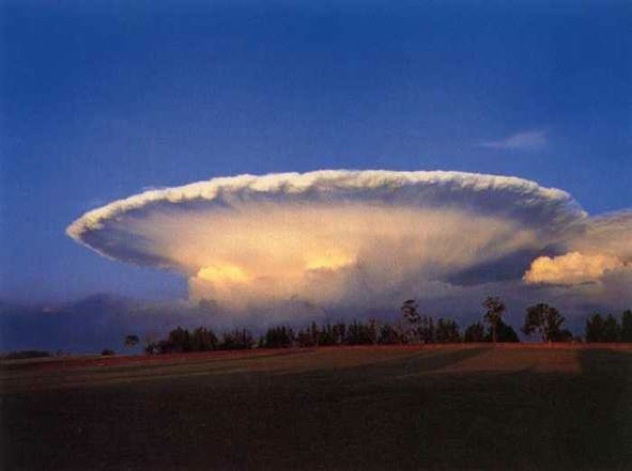 Here’s another phenomenon that has to do with ice crystals in the atmosphere. 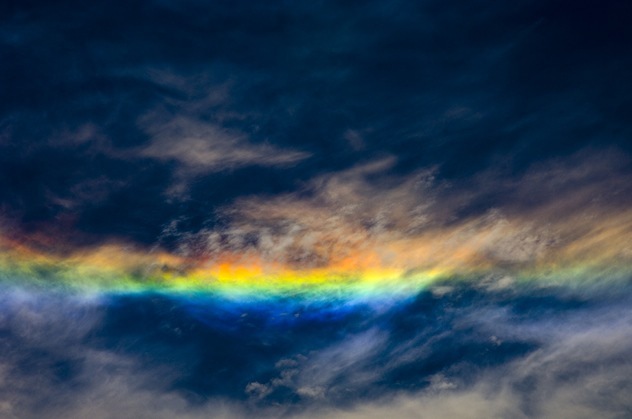 Like fire rainbows, sun dogs are massive halos in the sky as a result of light refraction—though in this case, they appear to actually encircle the sun. 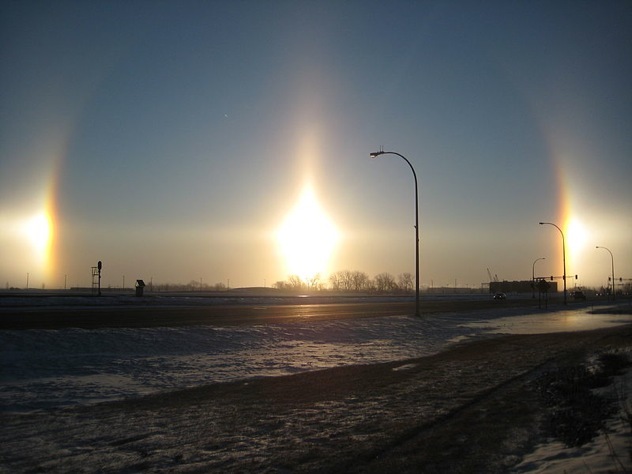 Sun dogs can be recognized by the two distinctive bright spots on either side of the halo—if these blips are bright enough, it can even look like there are three suns in the sky, all side by side. And the good news is that this happens all the time, all over the world, so you’ll be able to start seeing them if you look closely enough (especially when the sun is low in the sky). Just remember that if you look closely enough at the sun for too long, you won’t be able to see much of anything. Ever. So try to be careful. Waterspouts are exactly what they look like, and exactly as awesome as they sound: they’re tornadoes that form over water. Because of this, they don’t pose a major threat unless you happen to be in a boat—but if you are, then watch out, because these things can achieve speeds of up to 190 miles (305 kilometers) per hour. In fact, it’s been speculated that many mysterious shipwrecks—such as those within the Bermuda Triangle—are simply a result of bad luck with waterspouts. 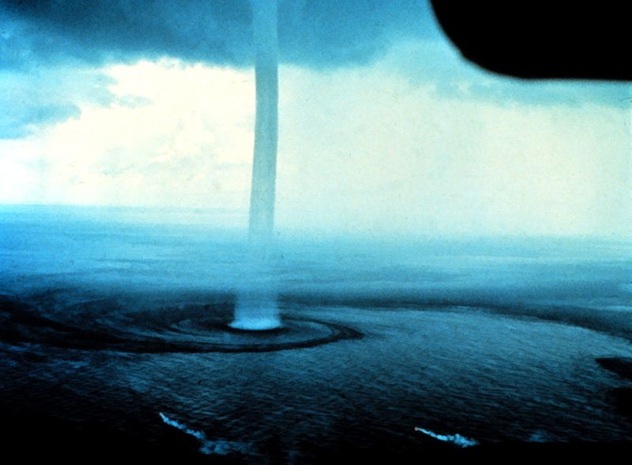 They can occur anywhere over water, but are especially prevalent in the Florida Keys, where there can be 400 or 500 waterspouts a year. You know how when you were a kid, and it snowed outside, the first thing you did was roll up a nice big snowball? You either threw it at somebody’s face or made a snowman with it (depending on what type of kid you were), but that’s not the important part of the memory right now. 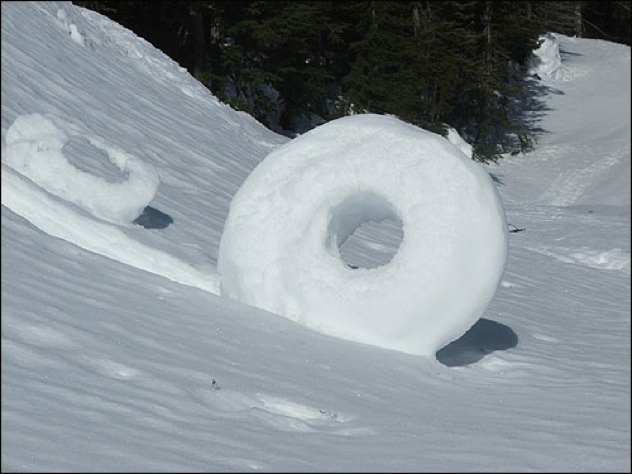 The important thing—the fantastic thing—is that nature has its own way of rolling snowballs: snow donuts. These rare shapes are formed—under perfect temperature conditions only—when a mass of snow either falls or is blown by the wind. If it manages to catch on to some other snow, and gravity or the wind is in its favor, then the new snowball will roll itself in the exact same way we all used to. In this case, though, the middles tend to collapse to create a donut shape, which can end up as tall as 26 inches (66 centimeters). At some point in time, basalt looked at itself in the mirror and realized that if it ever wanted to be noticed by the cool kids in nature (us), it would have to step up its game. And so, much like the unpopular girl who is secretly gorgeous when she takes her glasses off, basalt showed the world what it was capable of—by arranging itself into columns. Admittedly, on the surface this doesn’t seem all that impressive—columns aren’t traditionally very exciting—but when put together into a sprawling honeycomb, this type of basalt is a sight to behold. The unique formations are a result of lava flows cracking as they cool, in a perpendicular direction to the original flow. 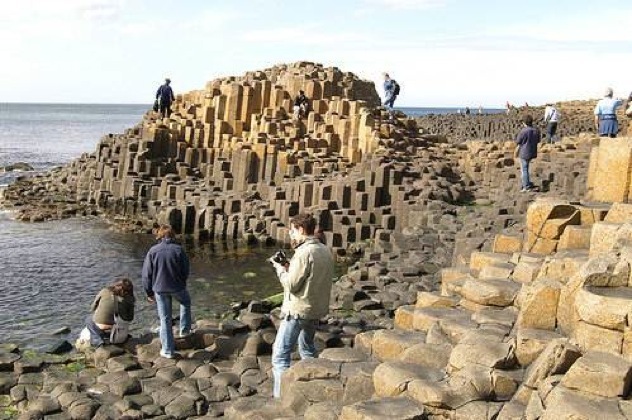 Columnar basalt clusters can be found all over the world—and then, naturally, climbed. To put it simply, frost flowers are flowers made of frost. 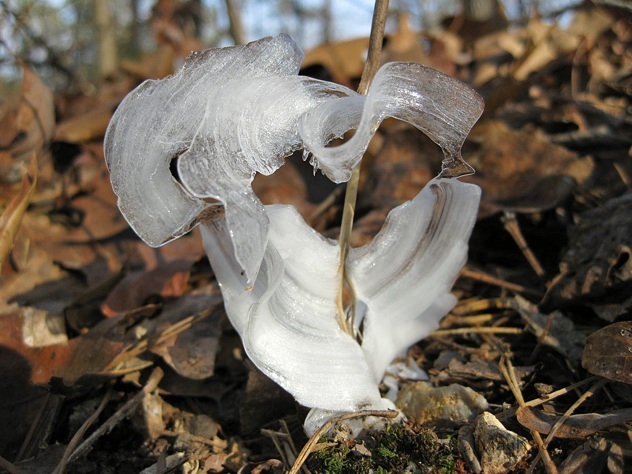 More accurately, frost flowers are nothing like that, so let’s put it technically instead: they’re buildups of ice particles around the base of certain plants and types of wood. When the temperature outside the plant is below freezing and the temperature within them is not, then water is pulled to the surface in a process similar to transpiration. This leads to a fragile chain of ice being pushed outward, which ends up forming sprawling, delicate formations. So they’re not exactly flowers—more like leaves, if anything—but they’re just as pretty to look at, and at least twice as cool. MJ Alba is a key part of the Twitter revolution @MattJAlba. He’d love it if you followed him, and quite frankly would be heartbroken if you didn’t.